competitive antagonist [3H]CGS 19755 (45). Similarly, alcohols do not interact with the modulatory sites for dissociative anesthetics, oxidation-reduction reagents, polyamines, protons, and Zn2+ on the NMDA receptor channel (32,40,46). In contrast, results from several of the early studies suggested that alcohol interacts with the NMDA receptor glycine coagonist site (21,42-44,47) and that Mg2+ could enhance the inhibitory effect of ethanol (48-50), whereas in other studies, interactions of alcohols with the glycine (24,32,34,40,51,52) or Mg2+ sites were not observed (32,40,41,44,46) (Fig. 3). The discrepant results regarding ethanol interaction with the glycine site have not yet been entirely resolved, but may, in part, arise from differences in experimental techniques, differences in NMDA receptor subunit composition (53), or differences in intracellular modulators that vary with cell type and experimental protocol. For example, ethanol inhibition and its reversal by high concentrations of glycine differ in cerebral cortical and cerebellar granule neurons (46,54). In one study using rat cerebellar granule neurons in culture, high concentrations of glycine reversed ethanol inhibition of NMDA-acti-vated steady-state current when the perforated-patch recording mode was used, which largely preserves the intracellular milieu, but not when the intracellular environment was altered by using the whole-cell patch-clamp recording mode (55). Furthermore, pre-exposure to ethanol in the absence of NMDA enhanced ethanol inhibition of peak NMDA-activated current in these neurons. Thus, one or more intracellular factors, such as a protein kinase (54), rather than a site on the NMDA receptor itself, may contribute significantly to glycine reversal of ethanol inhibition of NMDA receptors in this cell type. With regard to Mg2+ enhancement of ethanol inhibition of NMDA receptors, the difference in the results obtained among the various studies most probably arises from the different techniques used. Studies reporting an enhancement of ethanol inhibition by Mg2+ did not measure NMDA receptor function directly, but, instead, measured changes in membrane potential or second-messenger levels. Because Mg2+ has effects on proteins other than the NMDA receptor, actions of Mg2+ on these additional sites could influence or obscure effects mediated by the NMDA receptor, which could account for the increases in the slopes of the NMDA concentration-response curves in the presence of Mg2+ observed in those studies (48-50), as well as for the observation of apparent competitive inhibition of NMDA receptor-mediated responses by Mg2+ (50), a known ion-channel blocker (56,57). Finally, although Mg2+ was observed to alter the half-maximal inhibitory concentration (IC50) of ethanol in these studies, results of experiments in which ethanol and Mg2+ concentration were covaried indicated separate sites of action of ethanol and Mg2+ (48,49). As would be predicted from the observations of noncompetitive inhibition by alcohol of NMDA receptors, results obtained using single-channel recording have shown that ethanol and related alcohols inhibit NMDA receptors via effects on gating of the ion channel. 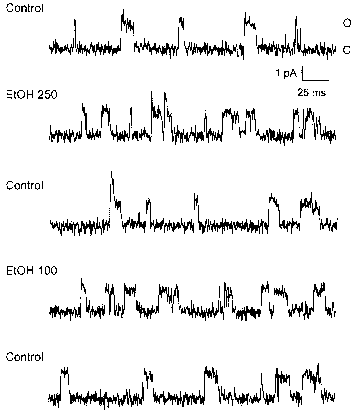 In outside-out membrane patches from rat hippocampal neurons, ethanol inhibited NMDA-activated single-channel current primarily by decreasing the mean open time of the channel (19). Similarly, in outside-out membrane patches from mouse cerebral cortical and hippocampal neurons, ethanol inhibited NMDA receptor single-channel current by reducing both the mean open time and the frequency of opening of the ion channels by approximately the same extent (58). The observation in this study that there were no changes in fast closed-state kinetics or open-channel conductance in the presence of ethanol also provides evidence that ethanol does not produce open-channel block of the receptor. The identity of the precise molecular sites of action of alcohol on NMDA receptors has remained elusive. One approach used to determine the characteristics of such a site was based on the observation that alcohols exhibit a "cutoff' effect (59-64). As the molecular size of a series of analogous alcohols is increased, a point is reached at which the biological potency attains a maximum; potency then levels off or declines with further increases in size. In mouse hippocampal neurons, the NMDA receptor inhibitory potency of a series of primary straight-chain alcohols exhibited a distinct cutoff: potency increased with increases in carbon chain length up to seven carbon atoms, and decreased precipitously above this point (65). These observations were originally interpreted to result from exclusion of the larger alcohols from an amphiphilic alcohol-binding site of fixed dimensions, which would allow estimation of the molecular volume of this site. Results of a subsequent study, however, indicate that this effect appears to be attributable primarily to an inability of the higher alcohols to achieve adequate aqueous concentrations, rather than to the inability of these alcohols to bind to a site of action because of their physical dimensions (66). 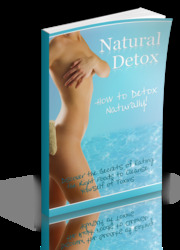 In a recent study (67), two alternative approaches were used in an attempt to localize the site of alcohol action on the NMDA receptor. The first approach involved truncation of the intracellular C-terminal regions of the NR1 and NR2 subunits to determine whether these regions contained the site of action of alcohol. Results of this study indicated that the C-terminal domain of the NMDA receptor is highly unlikely to contain the site of ethanol action, because removal of virtually all of the C-termini of the NR1 and NR2B subunits did not abolish the inhibitory effect of ethanol (67) (Fig. 4). The second approach involved selective application of alcohols to either the extracellular or intracellular side of the membrane in cells transfected with NMDA receptor subunits and cell-free membrane patches from these cells. In these experiments, alcohols inhibited NMDA-acti-vated current only when applied to the extracellular side of the membrane (Fig. 5). Under the conditions used in these experiments, the alcohols would have access to residues in the transmembrane regions of the receptor protein that are exposed to the surrounding membrane lipids. Thus, the site of alcohol action is located either in a region of the receptor protein that is directly exposed to the extracellular environment , or in a transmembrane domain in a region that is accessible only from the extracellular environment (Fig. 6). Fig. 6. The region of the NMDA receptor containing the site of alcohol action. 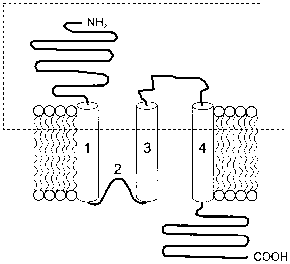 The diagram shows a single NMDA receptor subunit in a membrane bilayer. The part of the figure above the membrane corresponds to the extracellular environment, and the regions numbered 1-4 are the membrane-associated domains. 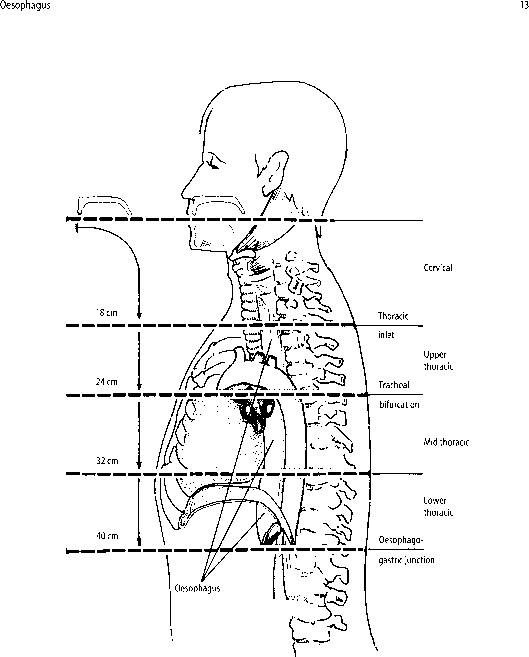 The probable region containing the site of alcohol action is located within the box (dashed lines). ethanol. Thus, proteins that interact with the intracellular C-terminal region of NMDA receptor sub-units may also regulate ethanol sensitivity. As discussed earlier, however, the C-termini of the NR1 and NR2B subunits do not contain the site of action of ethanol. 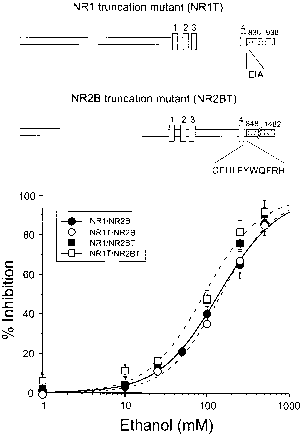 Interestingly, truncating the intracellular C-terminal domain of the NR2B subunit slightly increased NMDA receptor ethanol sensitivity (67) (Fig. 4), suggesting that the regulatory influence of the C-terminal domain upon alcohol sensitivity differs among subunits and depends on experimental conditions. Recent studies using site-directed mutagenesis in recombinant NMDA receptor subunits have reported that a residue in the third transmembrane domain of the NR1 subunit can influence ethanol sensitivity (74,75). As this amino acid is located in the region proposed to contain the site of alcohol action, it may constitute or form part of the alcohol-binding site. Non-NMDA glutamate-gated ion channels are further divided into two groups based on their relative sensitivity to a-amino-3-hydroxy-5-methyl-4-isoxazole propionic acid (AMPA) or kainate (6) (Chapters 1 and 2). AMPA receptors mediate the great majority of fast excitatory neurotransmission in the central nervous system (6,76). Kainate receptors also mediate fast excitatory neurotransmission in the central nervous system and may also modulate neurotransmitter release through a presynaptic action (76). Because of the widespread distribution of AMPA/kainate receptors and their importance in neurotransmission, the effects of alcohols on these receptors could profoundly influence the excitatory tone and function of the central nervous system. The first observation of alcohol modulation of AMPA/kainate receptor function was that efflux of 22Na+ from slices of rat striatum evoked by the non-NMDA receptor agonists kainate or quisqualate was inhibited by alcohols from methanol to butanol (17). In this study, alcohols inhibited responses to kainate or quisqualate more potently than responses to NMDA, which is in contrast to results obtained in the majority of subsequent studies. For example, alcohols from methanol to isopentanol inhibited kainate- and quisqualate-activated ion current less potently than NMDA-activated current in mouse hippocampal neurons in culture (18). Preferential inhibition of NMDA versus non-NMDA receptors was also observed in a study using extracellular recording in rat hippocampal slices, in which 100 mM ethanol inhibited NMDA receptor-mediated postsynaptic potentials by approx 45% and AMPA/kainate receptor-mediated postsynaptic potentials by approx 10% (10). A number of other groups have also reported more potent inhibition of NMDA versus non-NMDA receptor-mediated responses, including agonist-evoked nor-epinephrine release in human cerebral cortical slices (77), postsynaptic potentials in rat spinal cord slices (78), depolarization in rat brain slices (79), agonist-activated current in rat cerebellar granule neurons (80), and cortical neurons (81). It is likely that the responses in the above-described studies were mediated predominantly by AMPA receptors rather than kainate receptors, even in cases where kainate was used as the agonist, because AMPA receptor expression is much greater than kainate receptor expression at the majority of synapses and kainate can activate AMPA receptors as well as kainate receptors (76). Intriguing results obtained in a recent study suggest that kainate receptors may be more sensitive than AMPA receptors to ethanol inhibition. In this study, kainate receptor-mediated postsynaptic potentials and kainate-activated current in rat hippocampal CA3 pyramidal neurons were inhibited by relatively low concentrations of ethanol (e.g., 20 mM), whereas AMPA receptor-mediated postsynaptic potentials were not affected by ethanol at these concentrations (82). The AMPA receptors are composed of one or more types of the non-NMDA glutamate receptor subunits GluR1-4, each of which occurs in forms termed "flip" and "flop" because of alternative RNA splicing at a 38-amino-acid segment preceding the fourth transmembrane domain, and kainate receptors are composed of one or more types of the subunits GluR5-7 and KA1-2 (6). Despite initial reports of lower ethanol potency for inhibition of AMPA/kainate receptors in native neurons and tissues relative to NMDA receptors, ethanol inhibited recombinant AMPA receptors formed from various combinations of GluR1, GluR2, and GluR4 subunits transfected in mammalian cells with potencies comparable to those observed for NMDA receptor inhibition (83). Although the flip splice variants of these subunits were used in this study, the ethanol sensitivity reportedly did not differ in the flop forms; however, a recent study in Xenopus oocytes reported lower potencies for ethanol inhibition of the flop forms of GluR1 and GluR3 (84). In addition, ethanol inhibition was similar among various combinations of the AMPA receptor subunits GluR1, GluR2, and GluR3 expressed in Xeno-pus oocytes (85). Results obtained to date suggest that potency for ethanol inhibition of kainate receptors also does not highly depend on subunit composition. Ethanol inhibition was reported to be similar in receptors containing GluR5, GluR6, KA1, and KA2 subunits expressed homomerically (in the case of GluR5 and GluR6) and in various heteromeric combinations in both Xenopus oocytes and trans-fected mammalian cells (86). As is true of NMDA receptors, ethanol inhibition appears to be noncompetitive with respect to agonist in both AMPA (28) and kainate (86) receptors; beyond this, little is known at present about the mechanism of alcohol action on AMPA/kainate receptors. A site in the fourth membrane-associated domain of the GluR6 subunit that is involved in volatile anesthetic sensitivity apparently has no influence on the alcohol sensitivity of this subunit (87). The cutoff for inhibition of AMPA/kainate receptors by a series of alcohols (see above) appears to differ little among subunits (84,88,89), and such observations have not revealed specific structural information about putative alcohol-binding sites.